The Bergen Saratoga Apartments opened this weekend at 331 Saratoga Ave. in Brownsville. 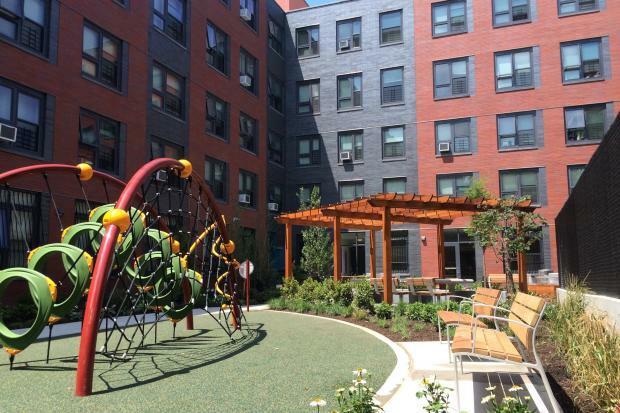 BROWNSVILLE — An 80-unit building of affordable and supportive housing for formerly homeless residents officially opened in the neighborhood this week, the complex’s developers said. The Bergen Saratoga Apartments, located at 331 Saratoga Ave. in Brownsville, is home to 39 very low- and low-income households selected by lottery to live in the one- and two-bedroom subsidized rentals, said Dunn Development Corp. In total, 55,000 people applied through the city-run affordable housing lottery to snag an apartment in the Saratoga Avenue building, the developers said. Half of the units were awarded to residents of Brownsville, a Dunn representative said, and one apartment is reserved for a live-in superintendent. Also in the complex are 40 studio apartments for formerly homeless people, which will be given on-site support services run by the Brooklyn-based non-profit CAMBA, Inc. Tenants of the studios were referred to CAMBA by the city's Department of Homeless Services and selected separately from the city lottery, the developers said. The Bergen Saratoga Apartments were built by Dunn Development — a real estate group that specializes in supportive and affordable housing in the Bronx, Brooklyn and Upper Manhattan — in conjunction with support from the city and state in the form of tax credits, rental subsidies and services through the “New York/New York III Initiative,” a city program that aims to provide supportive housing to homeless New Yorkers. The 5-story complex includes a 24-hour front desk, bicycle parking, a backyard with gardening plots for tenants, a computer room, library and children’s play area, the developers said. Work on the complex began in the summer of 2014, according to a report from YIMBY, wrapping up this spring.